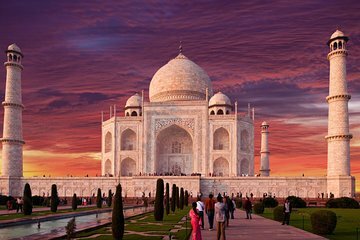 Benefit from the ability to travel at your own pace and the attention of a private guide on this private sightseeing tour to Agra from New Delhi. Travel to your destination in a private, air-conditioned vehicle, and enjoy easy transportation between all of Agra's sights as well. Entrance fees to the Taj Mahal, the Agra Fort, and the Baby Taj (the tomb of I'timad-ud-Daulah) are included, as well as a gourmet buffet lunch at a 5 Star hotel. Amazing day, both the driver and guide were fantastic. Great hotel and food also. Would definitely recommend! !